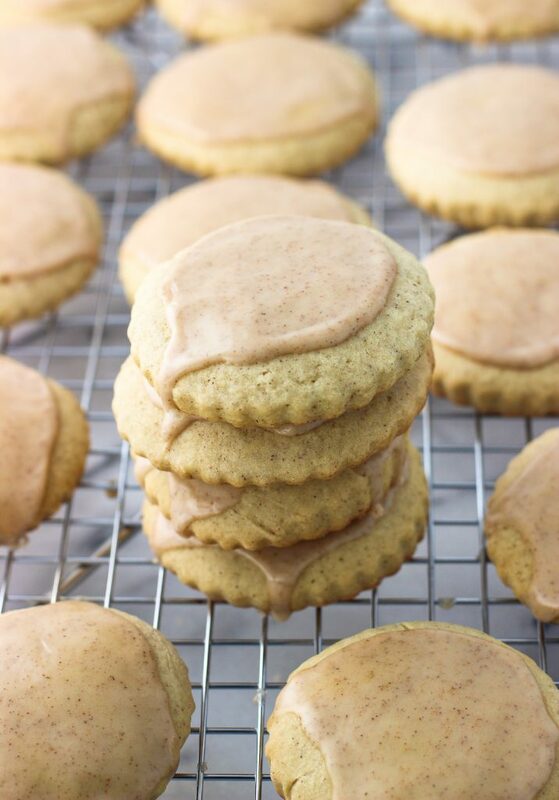 Cinnamon maple sugar cookies are tender and cinnamon-spiced, with a hint of maple flavor in the dough. Top with an easy, quick-setting cinnamon glaze and these are ready to serve! This recipe for cinnamon maple sugar cookies in particular is based off of a family recipe, which is on the tender side that yields cookies that puff up as they bake. They’re airy and light (in texture, I’m making no claims as for their nutritional value) and stay soft for days. You’ll notice maple extract is used as the maple flavoring here instead of maple syrup. Maple extract, much like vanilla extract, only requires a little bit to be used, and doesn’t throw off the dry to wet ingredient ratio or add additional sugar like using syrup would. Cream together butter and sugar in a mixing bowl. Add vanilla and maple extracts and mix until combined. Add eggs and mix until smooth. Whisk together flour, cinnamon, cream of tartar, baking soda, and salt in a separate bowl. Slowly add dry ingredients to the bowl with the butter mixture and mix until just combined. The dough should be in a ball shape and just a little bit sticky. If dough is too sticky, add additional flour 1 tbsp at a time until it reaches the right consistency. Wrap dough ball in plastic wrap and chill in the refrigerator for at least 2 hours. Once chilled, preheat oven to 375°F. Line a baking sheet or two with parchment paper and set aside. Roll dough out onto a floured work surface until it's about 1/8" thick. Cut cookies with cookie cutters and place about 1 - 1 1/2" apart from one another on the prepared baking sheets, rerolling any scraps and repeating until all of the dough is used. Bake for 8-10 minutes, or until cookies are lightly golden brown on the edges. Let cookies cool for a few minutes on the baking sheet, then transfer the cookies to a rack to cool completely. Whisk together all ingredients in a bowl and see how you like the consistency. If you'd like the glaze to be thinner, add additional water a very small amount (1 tsp) at a time and whisk. Spread glaze on cookies, and allow glaze to harden before stacking or storing. 0 Response to "Cinnamon Maple Sugar Cookies"